I bought a medium FURminator from Ebay after reading all the wonderful write ups on here, we have 2 corgi's and during shedding season, our lounge looks like it has snowed! Both of my boys love to be groomed, in fact they both lie down and I see the "Corgi Smile" I brush them for about 10 mins each, and in that time the amount of fur I get from them reduces. I use this every day for both of them, I dont press too hard and they sit still for the whole time we are grooming, then they both Frap like mad, purely I think because they feel lighter! I ordered my furminator online through this site since it was on sale and it arrives Monday! I can't wait! I have to get to brushing my dogs. I had surgery and haven't been able to really get to them yet. I always take them outside and way back in the yard to keep the hair from getting in the pond. I just leave the fur on the ground and it's usually gone by the next afternoon. The birds in our area have to have the softest lined nest in the world..LOL! 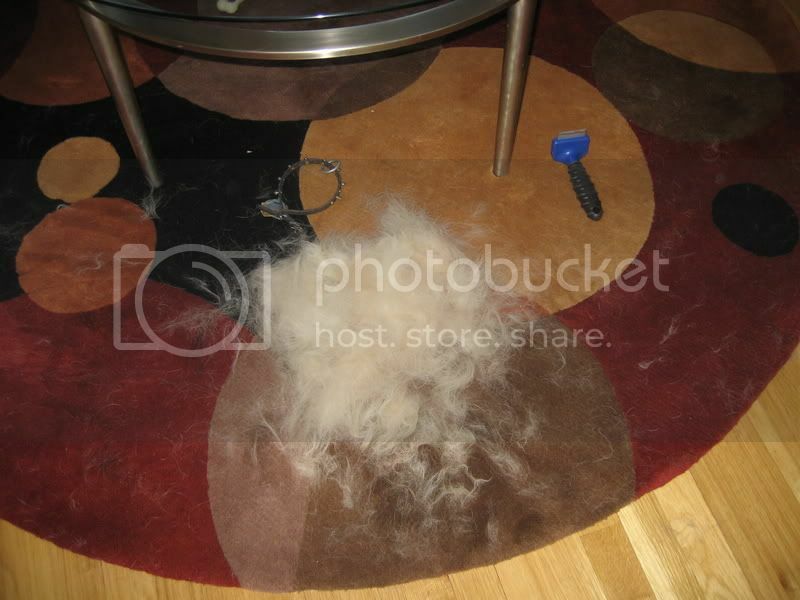 Is there not some concern that a Furminator may remove some healthy hair as well as the loose stuff? One may not want that. I've only used a rather wide blunt-toothed dog comb, gets a lot of loose stuff out, then it tapers off. I've been a bit afraid of the furminator because I don't want to remove anything but loose hair. Ours is a cool, wet climate and heat is only a consideration above timberline for a coupla months in summer. Keeping warm is more of an issue than keeping cool, mostly. I'd like to try ti though. My guys seem to really like the furminator -- they get the same look on their faces they get when getting a belly or neck scratch (that blissfull look of "do this all the time, please!") -- so I've been thinking if it did pull out a ton of healthy hair, it would be uncomfortable to them (like a waxing -- ouch!). I mean, they aren't squeamish about letting me know when they don't like something (oh, like, say, nail clipping or my walking by the treat jar without dipping my hand in it). And I like it the best of all the brushes/combs I've tried when they are really putting out those big tufty tumbleweeds of fur, it really cleans up their coat (but there's a good, thick coat left, to be sure). But then, in CT, we have a pretty hot, humid summer, so a slightly thinner coat is helpful (although not this month -- all rain, all the time, we feel we're in the NW instead of the NE now!). Ooo i want one so bad. But Eddy doesn't shed....... YET! So I'm going to wait. I love them too and use it on our 2 cats. Plus I got a REALLY big one to use on the horses in the spring when they shed their winter coats. I HAVE 2 FURMINATORS FOR MY CORGI...ONE FOR HER BACKSIDE AND ONE FOR HER TUMMY...THEY R WONDERFUL...AND I DO COMB HER OUT EVERYDAY AND I HAVE NOTICED LESS HAIR IN THE HOUSE NOW...BEEN USING THEM ON HER FOR ABOUT A YR AND MONEY WELL SPENT.. This makes me want to but a furminator. I'm like you, $40.00 for a dog brush! But mine are the same way, they love to be brushed and I brush them very often, but it still seems like there is a lot of loose fur. You have me convinced, I need to get one! They're quite a bit cheaper on amazon. I think less than $20 for the medium size.